This week, with the broken machine finally dispatched to meet its maker, the lack of ice cream in my life has suddenly become too much. Like a runner who faints just before the finishing line, I can’t quite wait those final few moments until the machine is back in my life. The weather has finally got warm, there’s an abundance of gorgeous fruit around and I couldn’t wait any longer to make some sort of frozen dessert. Real ice cream without a machine just isn’t as good. Some people may disagree with me and yes, you can make a passable version by freezing, stirring, freezing and repeating to break up the worst of the ice crystals, but the texture is never going to be perfect, to deliver that smooth, melting mouthfeel of a really good ice. Sorbet is a second option, but I was craving something richer, and while I know a lot of people make very good no-churn ice creams involving a base of condensed milk, I wanted something a little more pure, less sweet, more natural. Something where the flavour of fresh fruit shone through. As you can see, I wasn’t being particular at all . . .
Semifreddo was the answer. A recipe in its own right rather than an ice cream imitation, this frozen treat is smooth, soft, creamy and everything you could want from a refreshing summer dessert. Made light with whipped egg whites, creamy with their yolks and packed with fresh fruit and very little sugar, it’s simple, refreshing and absolutely what I wanted. We’ve been eating a lot of peaches and nectarines this summer. On the weekend I bought about a dozen, and while the majority never made it further than the journey between fruit bowl and my mouth, I had enough beautiful white-fleshed nectarines to make this semifreddo. The fruit is blitzed, skin and all, with a little lemon juice and the most sparing sprinkle of sugar before being mixed with egg yolks and a little more sugar. A cloud of whipped egg white is folded through along with a generous glug of thick greek yoghurt. Because of the yoghurt, the final texture is slightly icy rather than the smooth effect you get with whipped cream, but in this instance I was happy to compromise and take the hit in return for the acidic tang of yoghurt against the sweet, bright nectarines. If you’re keen on a smoother texture, by all means substitute the same quantity of whipped cream. We ate this as a mid-week dessert, sliced in slabs on simple plates, hence the lack of fancy photos, drizzled coulis etc. It could easily be tarted up if you wanted, but I think this sweet is at its best in its purest form, a super simple palate-cleansing mouthful after a mid-week meal. Line a medium sized loaf tin (or smaller, individual moulds if you prefer) with cling film. In a blender, blitz the chopped peaches, lemon juice and 40g of sugar. Stir in the vanilla extract and Greek yoghurt until smooth and combined. In a large bowl, beat the egg yolks until pale and thick, about 3 minutes. Gently fold the egg yolks into the peach and yoghurt mixture. In a separate large bowl, whip the egg whites and remaining 40g sugar until thick and creamy. Gently fold one third of the egg whites into your peach base to loosen the mixture, then fold in the rest, taking care not to knock out too many air bubbles. Spoon the mixture into your prepared containers and freeze for eight hours, or overnight. 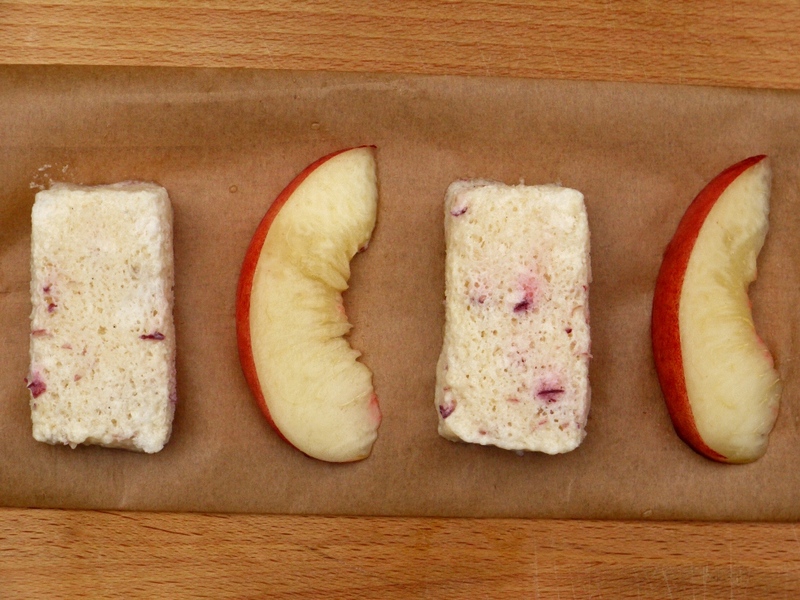 Serve in slices. Add a little coulis, summer berries or stone fruit, if you like. This looks lovely, very refreshing! I’ve been toying with the idea of purchasing an ice cream maker for ages now. I just can’t commit. There is always something else higher on the list – like a food processor, which I bought last week. This semifreddo sounds perfect for my ice-cream-maker-less life. Looking forward to trying it this weekend. Thanks for sharing and I hope your ice cream maker finds its way back to you, fixed and ready for another stab at peanut butter ice cream. 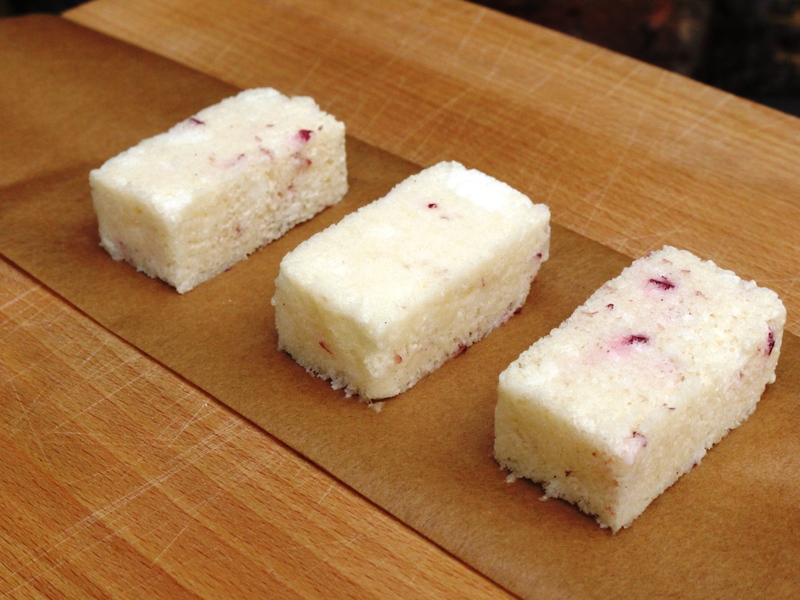 Excellent recipe and beautiful blog. Very glad I’ve found it. This looks delicious! Lovely photos too, you’re very talented! As much as I love peaches, I find myself eating nectarines everyday. They’re sweet, but slightly spicier, and I love the smooth skin. That being said, all I’ve ever made with them is a rustic tart. This looks so refreshing. I’ve always used a loaf pan and sliced, but I love the small version. 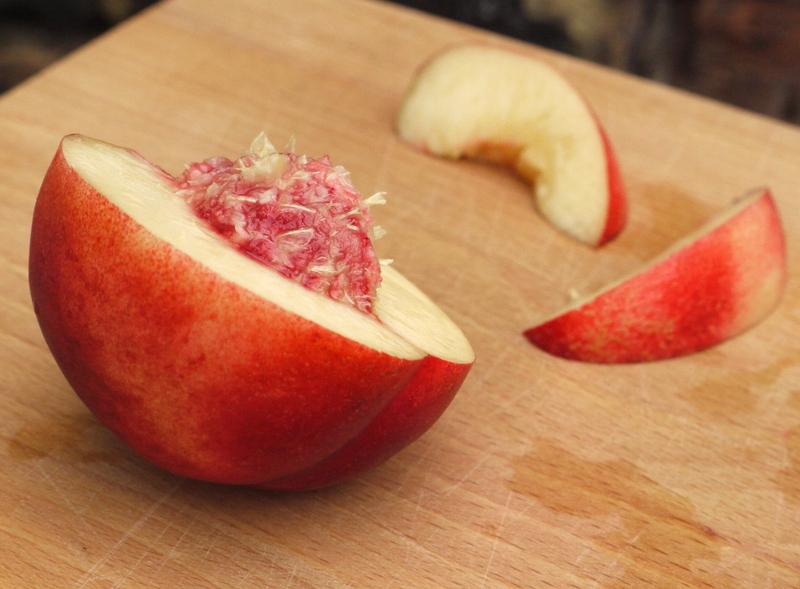 your photo of a cut peach with the stone still in is beautiful. my icecream maker broke, I need to get round to sending it back! I read somewhere that if you use the stirring method, let it almost completely set then blend it in a food processor then repeat the process it’s meant to come out really well, I’ve not tried it yet! This looks lovely and refreshing! 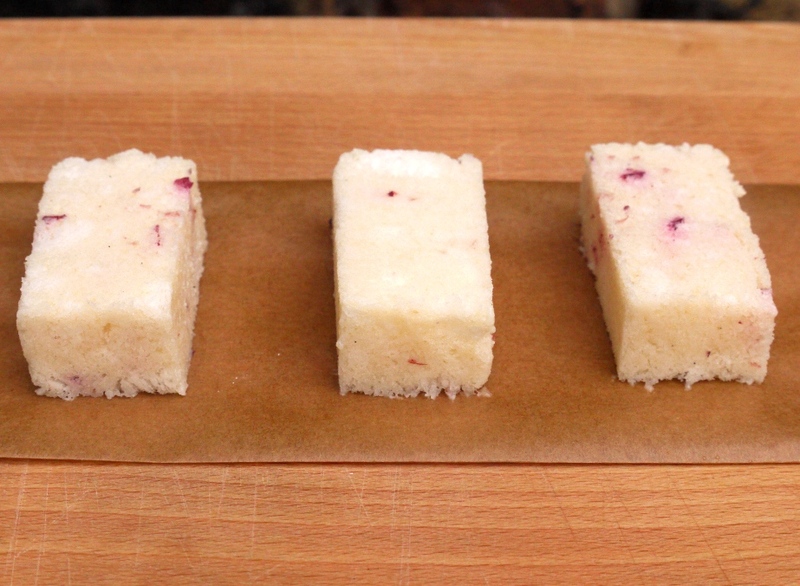 I’ve never tried making semifreddo so would love to give this a go. Hope you get your ice cream maker back soon. I hope you get your ice cream maker back! I’ve gotta say though, I can definitely see this bring an apt substitute. Yummy! Peaches and nectarines are the best. I am never get enough! Talley – thank you and enjoy the semifreddo if you make it! 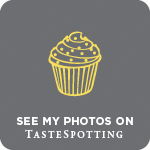 Food, Photography & France – glad you found it! 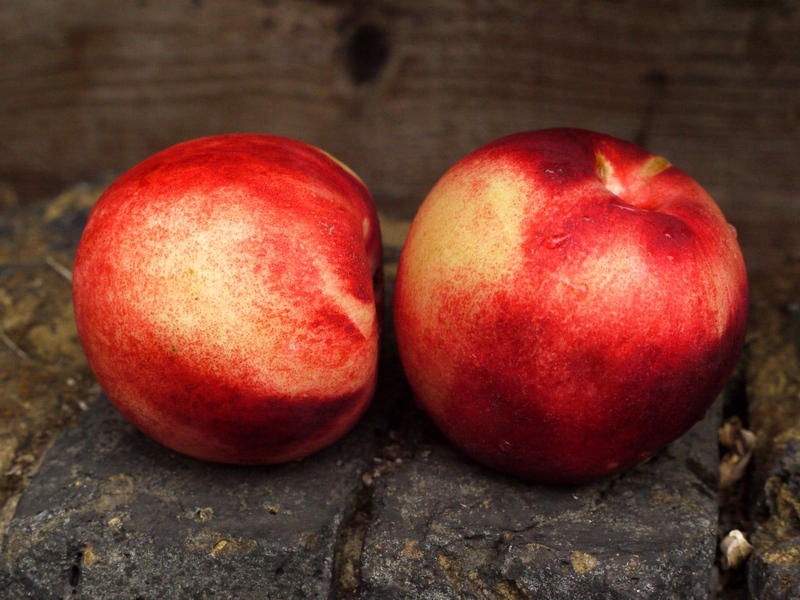 Sacha – I agree, peaches are lovely but I do enjoy the smooth skin of nectarines. Jenny – that sounds like a good tip – well worth trying out! Jaime – do give it a go! Kaitlin – thank you and yes, you’ve got to love nectarines and peaches! This is such a lovely summer dessert! Eat Little Bird – I absolutely do agree! I love the sound of this especially as I have just started to use my ice cream maker again. I can’t get enough nectarines at the moment. Something tells me I’d like this dessert.